[Caledonian Mercury, Monday, November 30th, 1812]. In 1812, Yorkshire became the fulcrum of a revolutionary struggle, centred on the textile industry. Cropping frames were a new machine, developed to finish the nap of woven cloth. “Clumsy device though it was, the cropping-frame, tended by one man, could do the work of ten skilled hand-croppers.” [Phyllis Bentley, ‘The Pennine Weaver’, 1971]. Recently, we broke through the biggest brick wall in my family tree – an eighth of it had always been missing, as my paternal Great Grandfather’s birth proved impossible to trace, until recently. And to my absolute joy, we discovered my Lister and Smith ancestors. The Listers were Halifax then Huddersfield then Leeds- wool weavers and cloth dressers (croppers). The earliest we have got back to so far, one William Lister, described in 1791 Halifax parish records as “Stuffmaker” (stuff was a cheap form of woven woollen fabric). The Smiths of Longwood, near Huddersfield, were described as clothiers, “fancy woollen manuafacturers” and Thomas Smith, in old age, became a “Wool-sorter”. Which kind of explains my thirty year odyssey into woolsorting and the big loom in my living room! (Been warped up with some wool since before Christmas, but that’s another story). Thomas Lister, born 1791 in Halifax, appeared in Huddersfield sometime in adulthood. In 1812, Huddersfield was the epicentre of the Yorkshire Luddite Movement. Thomas was to become a woollen weaver, like his father before him but his son, Tom – my great great grandad – would be a “cloth dresser”. Many of the Luddites were cloth dressers. 1812 was as close as the UK came to its own French Revolution. The Napoleonic Wars affected export trade, and as a result, manufacturers felt obliged to cut corners, and shift their manufactories across to the new technology. One frame put nine men out of work. William Horsfall, manufacturer at Ottiwells Mills, Marsden, was determined to bring the frames into his mill. He said he’d ride through a river of blood to do it, if necessary. Back in 1811, Midlanders had smashed stocking frames that would put them out of work. Their leader, a shadowy figure who may or may not have been real, was “Ned Ludd”. 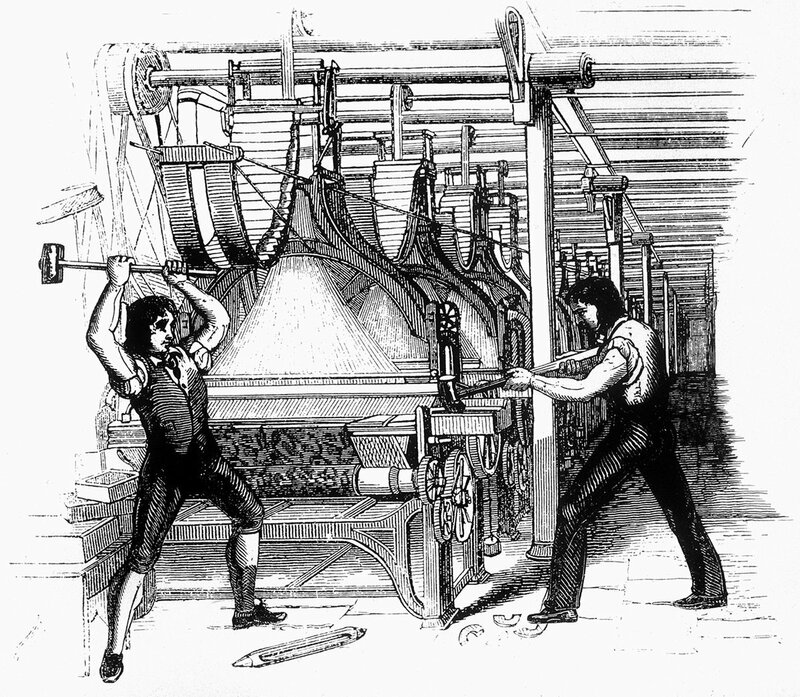 Machine-breakers were called “Luddites”. 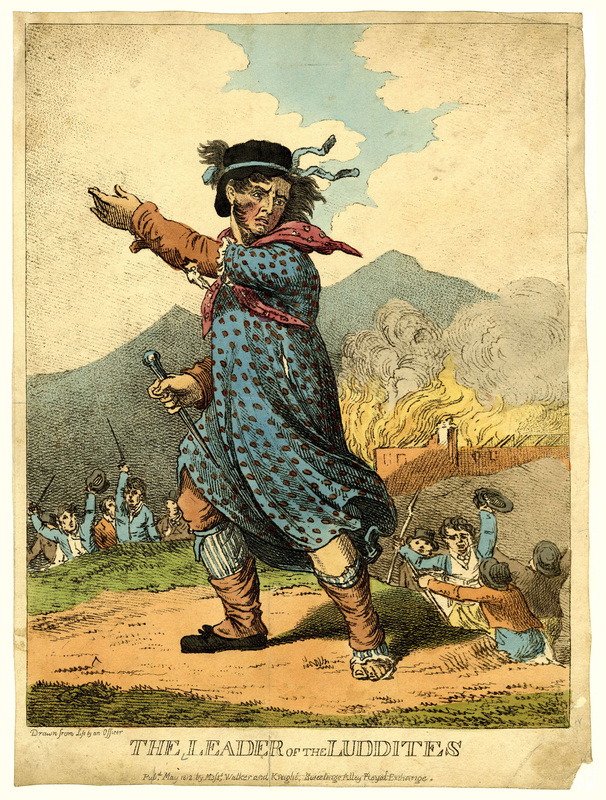 And by early 1812, Huddersfield had its own “King Ludd” – one George Mellor, a cropper. Mellor, Benjamin Walker, Thomas Smith and William Thorpe, were amongst the prime movers of the Longroyd Bridge Luddites. Taking the oath was called being “twisted in”, or “twissed in” – a reference to hand-spinning; twisting the separate fibres in to create a strong whole yarn. I have no way of knowing whether my great x 3 grandfather, Thomas Lister, ever got “twisted in”, or not. One thing is for sure – he was in Huddersfield by 1819 when daughter his Grace was born. Grace’s baptism was registered in the Non Conformist records for Kirklees, her parents down as “Thomas Lister clothier, Hill-Houses, Huddersfield Parish, by Elizabeth daughter of Ely Crabtree of Halifax.” Thomas is often down as “wool weaver” or just “weaver”. The last Census I found him in was 1861 where he was still at Hill Houses, Huddersfield, now living with his eldest daughter, Grace Milnes (“Yarn Reeler”) and her husband, a Chelsea Pensioner called John Milnes. I descend from Thomas’s son, Tom Lister, born Huddersfield 1829, and – unusually for the date – baptised as “Tom” not “Thomas”. He married Hannah Smith, in 1856. Hannah was the daughter of a larger scale clothier from Longwood, outside Huddersfield; Thomas Smith. The Smiths were clothiers, later “Fancy Wool Manufacturers” at Longwood, and may well have been on the other side of the Luddite fence in 1812. The Smiths, like the Listers in the early 19thC, were Non Conformists but in 1856, Tom Lister and Hannah Smith married at St Peter’s church, Huddersfield although subsequent children, Grace, Ellen, Tom and Sam, were baptised at a Zion New Connexion chapel. Tom is down as “Dresser” and there, Thomas Lister is “weaver” and Thomas Smith is “clothier”. In 1812, being a clothier in the Huddersfield area was a very dangerous occupation. Luddites were taking pot shots at clothiers, or waylaying them on the way to the cloth hall, and shredding their bolts of cloth. In 1812, the Luddites raided remote farmhouses for firearms. Soldiers were drafted in. At one point in 1812, there were over 400 soldiers billeted in Huddersfield alone and 12,000 in the district – it was said there were more soldiers in Yorkshire, than fighting on the Peninsular. It was a similar kind of guerilla warfare, too – the Luddites being born and bred in the area, knew the terrain well and could vanish into the night when the red-coats appeared… Newspapers describe them blackening or masking their faces and even wearing women’s clothing when they went out, at night, with smiths’ hammers to break the machinery. In April, Rawfolds Mill was the scene of a raid that turned into a pitched battle; an abortive exercise for the Luddites who retreated with two dead, and many injured. In the days that followed, Luddites felt more powerless and desperate than ever. Manufacturer Mr Horsfall, who had boasted he would install the new technology whatever the human cost, passed by the cropping shop where “King Ludd” Mellor worked. Thomas Smith, Mellor, William Thorpe and Benjamin Walker loaded their pistols at Wood’s cropping workshop: Walker and Smith setting off after Mellor and Thorpe. Smith seems to have been reluctant, and at the trial, the Jury were to ask for leniency for him. In vain. Smith expressed a wish to stop the others, using persuasion – but felt he couldn’t refuse to go, or he’d have been shot, himself. When they got to the plantation (Regency word for ‘small wood’), Smith separated off from Walker, trying to talk the other two into leaving off and shortly after returned to tell Walker they had said if they failed to take down Horsfall, they’d use the rest of their shots on Walker and Smith. All four fired on Horsfall and then melted into nearby Dungeon Wood, and the countryside beyond. Instead of helping Horsfall, those around were alleged to have jeered at him, and not made any attempt to capture the perpetrators. One witness, on horseback, was asked by Horsfall to ride back on the road and find and tell his brother. Horsfall’s body was carried to a pub, the Warren-house, a few hundred yards away. 38 hours later, Horsfall died of wounds sustained. Three of the shots that hit him had not been life-threatening, but a fourth shot went into his stomach and exited through a thigh, and infection set in. Horsfall was buried quickly, with no advance notice -presumably as the funeral might have sparked a riot – in Huddersfield Parish Church. The Huddersfield Constable put up a reward of £2000 for information leading to a conviction. The Luddites’ days were numbered. “The Derby Mercury” of July 19th, 1812, noted that two Bow Street officers had successfully infiltrated the Luddites, being “twisted in”, so being able to name the ringleaders and uncover an arms cache. On July 18th, the powers that were, swooped and made the majority of the fifty arrests they were hoping to make; later, others were added. These men were sent to York Castle, to await trial. In the case of William Mellor, the law was slightly less rigorous – charging him with murder on the word of Walker. Mellor’s address is given, in various newspapers, as “Longwood Bridge” but by the time he was executed, it was more correctly rendered as “Longroyd Bridge”. Within days of Horsfall’s murder, the Prime Minister was assassinated, by a disaffected linen merchant. I have Andro Linklater’s “Why Spencer Percival Had To Die” on audiobook, and it is a fantastic book – big recommend for an insight into the only assassination of a British Prime Minister in office, and also fascinating for anyone interested in textile history, as his murderer was a disaffected would-be importer of linen. In October, 1812, of the 43 felons committed to York Castle, a whacking 33 were Luddites, on various charges. The prison cells must have been teeming. Phyllis Bentley wrote: “…Once the chain of secrecy was broken, many Luddites gave themselves up, surrendered their arms and were pardoned – they described this process as ‘being untwissed’…” . Within weeks, Mellor and the rest were picked up, as Benjamin Walker, his eye on the £2000, turned King’s Evidence. My own, unrelated clothier – another Thomas Smith, lived at Dod Lee Green in Longwood, a few miles West of Huddersfield. He went into business with the area’s best known mill owners, John Hanson, carrying out business as a Woollen Manufacturer. In 1854, he decided to go it alone, processing woollen waste but quickly went bankrupt and ended up a warehouseman for a fellow mill owner, later a Wool-Sorter. The Smiths and Hansons were mill-owners through a period of rapid change; constantly updating technology, and by the middle of the Century, facing competition from abroad. It would be likely that the Listers may well have sided with the Luddites – the Smiths, on the other hand, would have benefited from the machinery and lower labour costs. Feelings ran high throughout the summer of 1812; imagined informants being “mobbed” and the West Riding still crawling with militia, posted to guard various scribbling mills and other manufactories. In autumn, 1812, it must have come rather close to home for the Smiths; two Kirkburton men were arrested for firing on the guards at a nearby mill. John Smith (appears to be no relation, or not a close one) and David Moorhouse. They were charged with burglary – as were a number of the Luddites whose involvement with specific raids could not be proven, but were found to have stolen fire-arms. Even with “the ring-leaders” behind bars, unrest continued. November 1812 newspapers put the number of Luddites imprisoned in York Castle, at a vague “between 40 to 50”. The Derby Mercury meanwhile reported that many “deluded” Yorkshiremen had gone into hiding, to evade capture, “thus sacrificing everything that should be most dear to them in life”. In January, 1813, 200 years ago, the trial of the West Riding Luddites went ahead. George Mellor, William Thorp and Thomas Smith – all of whom worked for Woods’ cropping shed at Longroyd Bridge and described as “cloth dressers” by the press – were tried with the murder of William Horsfall, Marsden manufacturer. All three offered alibis, which were rejected and they were found Guilty after a trial that lasted 12 hours and hung, then dissected at York County hospital. [The Hull Packet and Original Weekly Commercial, Literary and General Advertiser, Tuesday, January 12th, 1813]. This puts Thomas Smith as being born between about 1790-1793. All we know about his origins is that he was from Huddersfield. Whether he was related to my Longwood Smiths or not, I’ll never know. My own Thomas Smith was younger, born 1799. Some of the York Castle accused were acquitted, after the Judge decided they had acted “under the influence” of others. This was a politic move. To show conspicuous “lenity”, and hopefully quell the mob. Although the Judge did remark that should there be any trouble, he’d have then re-arrested and tried. In the afternoon, John Batley, John Swallow, Joseph Fisher, William Hartley, James Haigh, James Hey, and Job Hey were executed. All the men were reported to be contrite and faced death calmly. They all had wives and some had children. This was the largest number of men ever to be hung in one day, at York. Others were charged with administering an illegal oath, including John Baines the elder, John Baines the younger, William Blakebrough, George Duckworth, Charles Milnes and Zachary Baines. Two of Tom Lister’s sisters married men called Milnes. I wonder…. Of these men, only Zachary was found Not Guilty. It is likely these were the men who administered the twisting in oath to the Bow Street runners. Informant Benjamin Walker was imprisoned briefly then allowed to go free, and returned to Huddersfield where, according to Phyllis Bentley, he was shunned for the rest of his life. My own weaver, Thomas Lister continued to live at Hill Houses in Huddersfield, until old age. His son, Tom, married twice. His first wife, Mary McMillan, died very soon after they married and in 1856, fresh from his distilling adventures, he married Hannah Smith, the Longwood wool mill owner’s daughter, and shortly afterwards, they moved to Leeds. My great grandad, John Lister, was born in Leeds in 1872 at 7 Carlton Terrace, the house where Tom Lister lived when he came from Huddersfield. Incredibly, there is a photo of it (first house in foreground) on Leodis. Four more generations of the family were also to be born in Leeds – including myself. Tom died there in 1880, aged only fifty. Tom Lister’s widow, Hannah remarried – a Birmingham chainmaker, living in Leeds. He became a blacksmith making steam ploughs in Holbeck. My great grandad, John, was brought up by mum Hannah and stepdad, the Brummie, Charles Deeley (born 1848). In the 1891 Census, my great grandad was down as “John Daley” (enumerator had misunderstood step-dad’s Brummie accent? ), and he simply wasn’t showing when we searched for a “John Lister” born 1872, in the 1881 Census. As an adult, John dropped “Deeley” and reverted to his birth name, Lister. Which is why he seemed to suddenly appear as an adult, in the 1891 Census. I now have that eighth of my tree we thought we’d never find. And to find it is weavers, clothiers and cloth dressers, is the icing on the cake. Event this Saturday by York Alternative History, to commemorate the 17 hung. Images Courtesy Wiki Commons unless otherwise stated. What kind of idiot decides to knit a Dr Who scarf and a pair of mitts in under ten days? Yes, Gentle Reader… you are looking at her. Well, actually you are looking at a picture of Ori, the youngest and most naive dwarf in ‘The Hobbit’ – which is quite appropriate as it was a vague approximation of his gloves, I decided to knit. NB: These mitts are not a precise copy, just a simple inspired by. I don’t normally do ‘holiday knitting’, full stop. But one son was desperate for a Dr Who scarf; another for a pair of mittens or muffatees as worn by one of the dwarves in the new Hobbit movie. How could I resist? I knitted a half scale ‘Original’ series 12 Dr Who scarf, using the colours and sequence on this site, only as a 12 foot scarf is impractical to wear, halved the length of each colour stripe. I gave myself ten days to knit this – 60 st cast on, using 4mm needles and scrap or stash yarn. I finished in time, but did leave off the last few stripes, giving my son a fair half scale approximation at about five foot. For ‘The Hobbit’ muffatees, my 19 year old settled on the gloves of Ori. At first, I thought they were a travelling stitch – fair enough but slow, given I was making them from scratch with no pattern, within the same 10 days I was making the Dr Who scarf. Then I realised they are stocking stitch with garter ridges – knit sideways. I had no idea how to figure out the thumb, not getting a clear shot online or from two viewings of the movie, so I decided to wing it and figure it when I got to it. All my gloves are of the 19thC persuasion, knit the ‘right’ way up, with gussets for thumbs. So I decided to do a provisional cast on, to keep the CO sts live, and then worry about the thumb when I got to it. The originals look to be knitted from chunky wool, but I went with DK. Largely because I prefer the look of it, also I think they’re more practical to wear. Forgive the rubbish picture – getting even this one was like herding cats after capturing them and forcing muffatees onto their reluctant paws… He wears them every time he goes out, honest! Brigantia DK 100% wool in grey. 4mm needles or size needed to get gauge of 20 sts and 24 rows per 4 inch. If you’d prefer to knit in Aran, chunky or best of all, handspun, just knit a small tension square, and follow technique. Use any type of provisional cast on, to keep the CO sts live. Using provisional CO, CO 40 sts. Rep from * til you have 18 garter st ridges. Now place first 16 sts on waste yarn or st holder. This is where you will come back and work the thumb later. Rep row 1 – 3 on remaining sts til you have worked one ridge. Now place live cast on sts on 4mm needle. With work inside, fold into a tube and work a 3 needle cast off, joining beginning of work, to end. Leave 6″ tail so it is easy to sew in later. Now work 3 needle cast off on wrong side, for first 8 sts of mitt. Turn mitt right way out. You now need to switch to 4 4mm dpns or magic loop with a circ. PU 8 live sts waiting for you from beginning, PU 2 sts to close the gap, PU 8 sts waiting for you from end, PU 2 sts to close gap (or PU 4 and K 2 tog, twice if that gives you a neater finish). [20 sts] Work four rounds, or til it looks deep enough for you, work 1 round Purls, then cast off. Sew in ends on inside. Work second Ori-esque the same.